Although this book is very hard to find, it is great for bat-info! A very useful guide to Bat-episodes and such! This is Burt Ward's Autobiography. It is for people of the age of 18 years or older only, but if you meet those requirements, it's a GREAT book to get! You see what the boy wonder really went through! 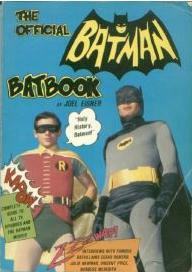 Adam West's book about Batman...although I do not own this book (YET!) I have heard many great things. Hear it all from Batman himself! Where can Batman and Robin drop you off at?